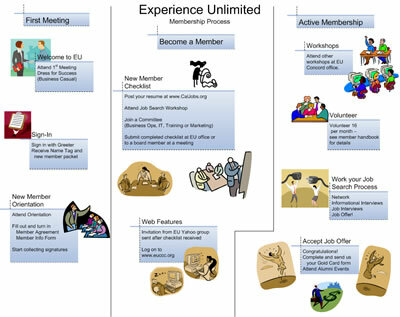 Experience Unlimited Contra Costa Chapter (EUCCC) is a volunteer network of business professionals who come together to provide a supportive environment that empowers our members with self-help job search and marketing skills and to provide a forum for professional networking and sharing job leads. Take the Rudgear Rd exit, go 0.2 mi, Merge onto S Broadway. After 1.4 mi turn right onto Mt Diablo Blvd. then continue onto Walker Ave. Just after Walker merges into Walnut Blvd., turn left onto Eckley Ln. Take exit 47 for N Main St toward Walnut Creek. Follow signs for North Main St South. Turn right off the exit ramp, onto N Main St. After .7 mi turn left onto Ygnacio Valley Rd. After .6 mi, **turn right onto Walnut Blvd. Follow Walnut Blvd (bear left where it forks) and turn left onto Eckly Ln after about .8 mi. Take the Mt Diablo Blvd exit. After .6 mi take the slight right to remain on Mt Diablo Blvd. After 0.9 mi continue onto Walker Ave, Follow Walker for .6 mi and just after Walker merges into Walnut Blvd., turn left onto Eckley Ln. Turn left onto Walnut Blvd (not Walnut AVENUE, which will come up first), then follow I680 Southbound directions from **. B'Nai Shalom will be on the right. DUE TO A DAYCARE PROGRAM AT b'nAI SHALOM, WE ASK THAT YOU DO NOT PARK AT THE TEMPLE. Out of respect for the neighbors we ask that street parking be limited to Eckley Lane. The BEST PLACE TO PARK is at the Mt Diablo Unitarian Universalist Church parking lot, LOCATED on the left just BEFORE B'Nai Shalom.